We provide group riding experiences for road cyclists. We particularly enjoy the many options for Easy/Green Circle rides (click here to see all four of our ride categories). Click here to see common Easy/Green Circle rides at FCCC's RidewithGPS directory. In the Filter field, enter "spring park, green" for common routes that will be used for 1st Sunday rides out Spring Park, or enter "ryan's, green" for common routes that will be used for Tuesday Evenings. 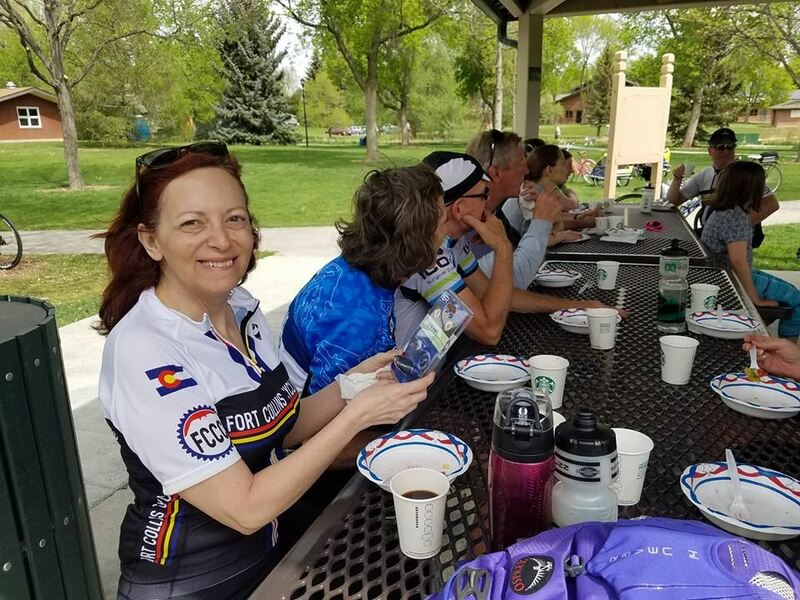 Whether you are new to group riding or want to take-it-easy; you will find numerous options for Easy/Green Circle riding with FCCC. Please, refer to the Club Calendar and/or our Facebook page for details such pre-ride briefing/departure time and planned route(s). To be added to the Easy/Green Circle ad hoc riding group; click here to join our app on BAND: https://band.us/band/71849637. Please contact FCCC Vice President, Stephen Beckley if you have questions. Please arrive at least 10 minutes prior to ride departure for the following regularly scheduled rides. These late-afternoon rides are, usually: a Tuesday; and, begin at the Trek Bicycle Store South and end at Ryan's Sports Grill. Afterward, please join us for beverages and food at Ryan's. We call it "debriefing" . Parking is suggested at the Lory Student Center (free after 4:00 p.m.); Parking Lots 310 or 315. These monthly Sunday-morning rides are usually less-than-fifteen-miles on bike-trails/low-traffic streets; beginning and ending at The Pavilion on the CSU Campus. The start-time is nine o'clock. After the ride, FCCC provides a free continental brunch: often including pecan rolls from the Silver Grill Cafe, a favorite! Reservation via club calendar is required. May, June, July, August, September (to be arranged) These late-afternoon/early evening rides are usually on a Thursday and start/end at a residence of a club member. After the ride FCCC provides food and soft-drink for a five-dollar-per-person (donation).